Support for East Ramapo Oversight Surges; Your Help Needed Now! 1. Monitor Bill- Your Action Needed! 1) Monitor Bill- Your Action Needed! Since the last time I wrote, there have been many new supporters of the new law to provide oversight for East Ramapo. 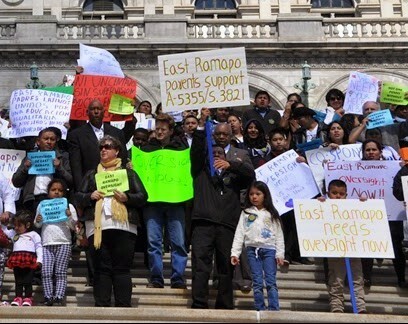 Call Speaker Carl Heastie and say: “I support Assembly Bill 5355 for oversight of the East Ramapo school district. Please bring it to the floor for a vote immediately”. 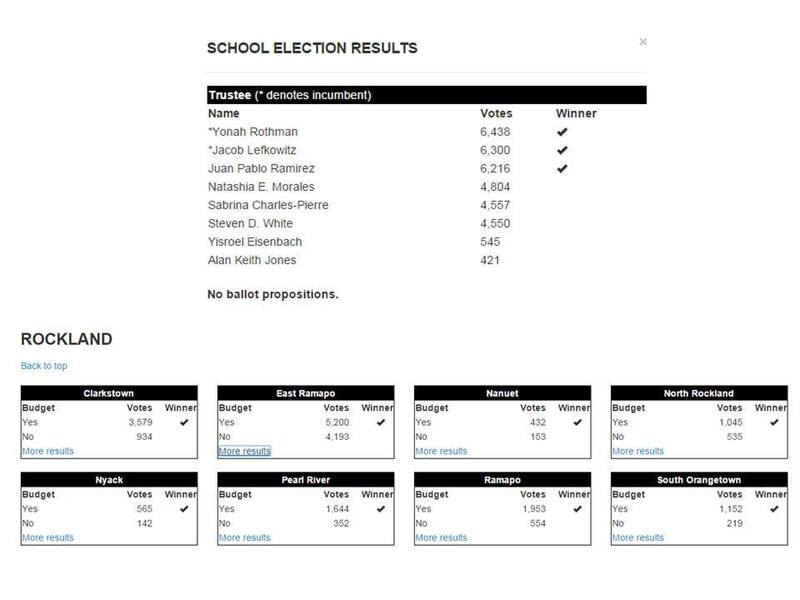 Andrew Mandel: ABSOLUTELY VALIANT EFFORT — School board results are in, and sadly two incumbents and their hand-picked “running mate” have won. 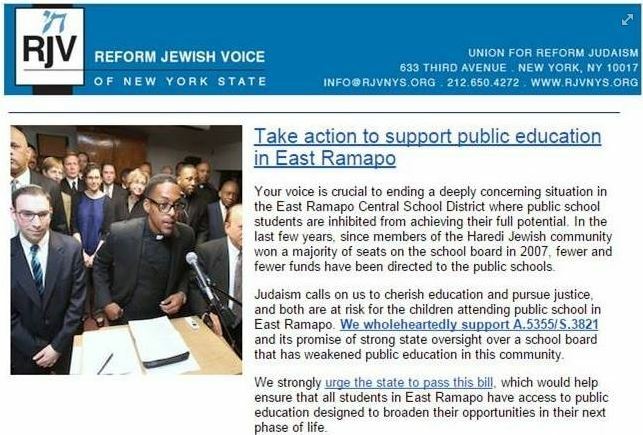 East Ramapo policies will once again be decided by the religious private school community. A huge ovation to Sabrina Charles-Pierre, Natashia Esperanza Morales and Steven White for stepping forward and representing the children attending district schools. With the incredibly huge turnout (highest in Rockland/Westchester/Putnam, 10x that of Nyack or Nanuet, twice that of Clarkstown), no one can say that the district was not mobilized. The special interests are just too powerful, which only affirms the need for oversight in order to protect the actual users of the public system. Albany, I hope you are watching. Sabrina Charles Pierre: First off, I would like to say thank you to all those who have supported since day one, to all who joined half way and to all those who will continue to walk with us to the finish line. Let us look on the bright side, even though we did not make it to the board, I must say we are all winners. As we were all shy 2,000+ votes, we must remember that majority of our student body are students with parents who are unable to vote, which would have reached beyond in numbers on top of the amount of votes received. We are winners because for once I can say our community came together to allow their voices to be heard as this has become not only known nationwide, but also internationally. Let us not look at the negative aspects of the situation as a downfall, but more so as a way to come up with a solution to equalize the justification that our children and our community needs. We didn’t make it this far to stop. Let this be a sense of motivation to strive and fight harder for what is right. We must not back down and allow the kids to know that we are still with them and shall continue to stand behind them. No one said this would be easy. Change is not going to happen over night. Our sense of UNITY in our commUNITY has been challenge. How bad we want it can only be determined by how far we decide to go from here. Time heal all wounds. We must recover, but not stay sleep. We as a commUNITY have so much more to offer if not so divided. What will it take? How much more damage will we allow? Let us not feel sorry. Let us walk with our heads held high. Lets be positive and come together. I will only consider us losers if we fall apart from here. We’ve come to far. Grab the rope and hold on tight for there is work to be done. Tender Steps Of NY, Inc. wants to make a difference in an underserved demographic within East Ramapo district. We seek to be the bridge to better communication within the Latino community and enrich the quality of their lives. With over three years of research and budget cuts, we have seen this community suffer and want nothing more than to aid. Lead personnel of TSONY, Inc. come from humble backgrounds and making difference is at the core of our purpose. We have found issues like language barriers, domestic abuse, lack of education, teen pregnancy, drug abuse and illegal residency to be some of the big issues we seek to improve. We have partnered with EPIC (Every Person Influences Children), Early Childhood Center and will be launching many helpful programs to begin making a difference. We want people to know we are a trusted resource making a difference. It is so important for us to gain the confidence of our community. The event takes place at The Chalet at Spook Rock Golf Course on June 6th from 12pm to 4pm. We will be serving a buffet style lunch and live blues and soul music. 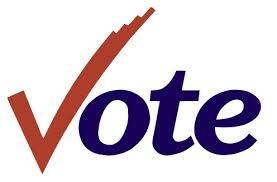 Founder and Executive Director of Tender Steps of New York, Inc.
Today: Vote! Rally in New City! 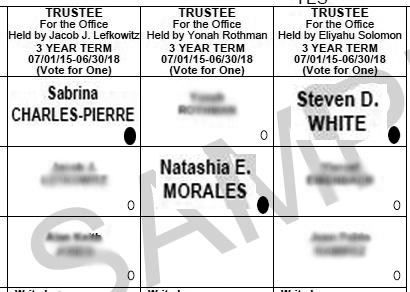 The Public School Candidates this year are: Sabrina Charles-Pierre, Natashia Morales, and Steven White. We will be celebrating at El Mana Restaurant, 28 N Main St Spring Valley after 10 PM. Join us! The Rockland County Legislature will HOPEFULLY vote on a Memorializing Resolution in support of State Assembly Bill A.5355 and State Senate Bill S.3821 calling upon the State Legislature to appoint a State Monitor to work with the East Ramapo Board of Education and Superintendent, and to ensure fairness and equity FOR ALL OUR CHILDREN. We are asking that you come to the meeting of the Legislature Tonight to support these Legislators and to make sure that they follow through. Our children’s future is at stake, we cannot afford to take anything for granted. Bring a sign!!! Wear Your Button!!! Let them know you care!!! Join us for phone banking on Monday Evening and Tuesday, or handing out flyers on Tuesday. Just send a message to: steve@poweroften.us for the info on where to go. We will be celebrating at El Mana Restaurant, 28 N Main St Spring Valley after 10 PM. Yes, the same day as the vote!!! We are asking you to call these Legislators and say: you fully support them; you support this bill; and failure to pass the Memorializing Resolution in the County Legislature is not an option. Let them know you are in their corner and they are doing the right thing. We are asking that you come to the meeting of the Legislature on Tuesday to support these Legislators and to make sure that they follow through. Our children’s future is at stake, we cannot afford to take anything for granted. Several New Endorsements of the East Ramapo Oversight Bill confirm what the supporters have been saying, and completely disprove what the critics of the bill have been claiming. Supporters say this bill upholds the civil rights of children to an education, critics say that the bill is anti-Semitic bigotry. The Unon for Reform Judaism says: “Judaism calls on us to cherish education” and “we strongly urge the state to pass this bill”. Supporters of the bill say it is fiscal mismanagement that is the chief cause of the district’s problems. Critics say it is only lack of state funding. The Alliance for Quality Education, the most vocal advocate for increased state funding for education in NY says: “It is AQE’s position that a state monitor is appropriate and necessary in the highly unusual circumstance where a board found to be favoring private schools is determining public policy.” and “The fact that public school students need protection from their own school board deserves immediate attention”. So, there you have it. Every single criticism of the bill is completely disproved by respected authorities on the issues. News 12 will be airing an extended special piece about the East Ramapo school district Saturday and Sunday, May 16 and 17. If you have Cablevision, tune in to Channel 12, if not, find a friend or neighbor who does! You can even watch it on your laptop or smartphone! Here are the times it will air: 5:00 AM – 7:00 AM; 8:30 AM; 11:30 AM; 2:30 PM; 4:30 PM. Justice is Coming, and YOU are making it happen!!! Candidates Forum TODAY; Make Those Calls! All Candidates are invited, please come and participate! Election Day is May 19, have you told everyone you know yet? 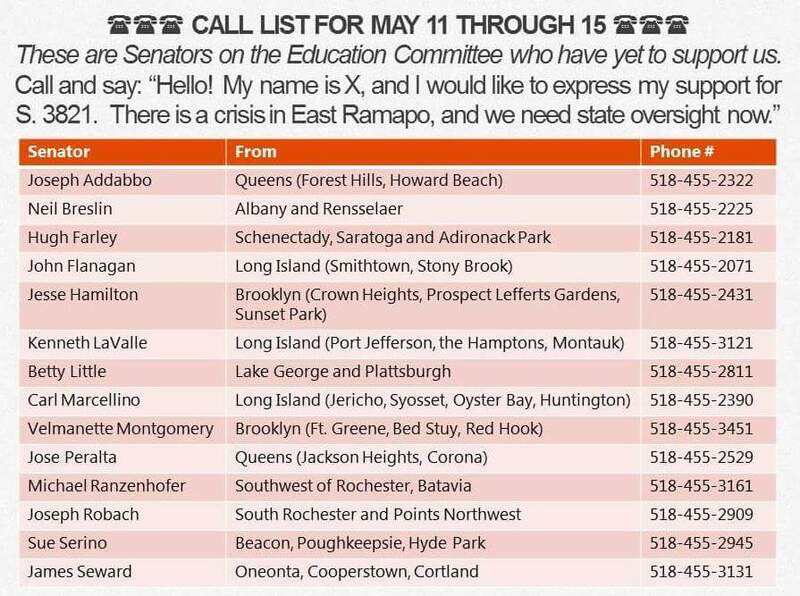 Have you called the NY State Senate Education Committee yet? The chairman of the committee has just been named Majority leader of the Senate! He needs to hear from you about why you support oversight for East Ramapo. While you are at it, why not call those friends and relatives around NY and ask them to call their Senators and Assembly Members too? If they are not familiar with East Ramapo, refer them to the Power of Ten webpage, where they can listen to the fantastic NPR radio show, or peruse the many newspaper articles (and Power of Ten emails) archived on the page. CALL your friends and relatives upstate and downstate asking them to call their own representatives in Albany. The New York City Bar Association has issued a multi-page legislative report in favor of A. 5355 and S. 3821. They found that students in the district are being denied a sound, basic education, that the board has failed to fulfill its fiduciary duties, and that the legislation is reasonably tailored to avoid overreach. The report, being distributed to members of the Legislature as we speak, punctures the argument that this bill is somehow an inappropriate use of state authority. This week we are engaging in a special action to support the East Ramapo oversight bill. Please take the time to make a few phone calls to key decision makers. It is very important that we make these calls this week. Please do not delay. 2. Protests Continue at Board Meetings TONIGHT! 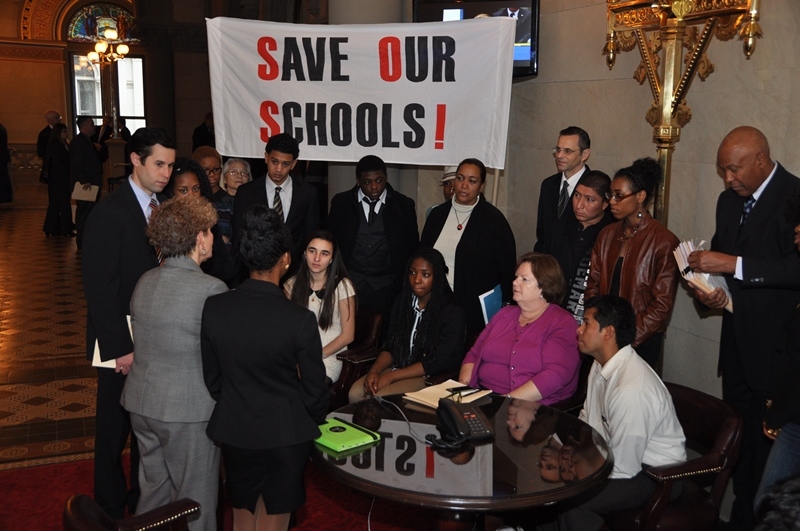 Over 350 parents, students, and supporters convened in Albany to support the legislation for oversight for East Ramapo. They made a dramatic impression on the senators and assembly members. Many reacted to the personal stories of the students who detailed the impact of the crisis on their lives. The parents made it clear to lawmakers that it is the State of NY which has the ultimate responsibility for ensuring a sound basic education, and that they welcome action from the state to ensure that right for their children. Right now only 15% of East Ramapo students are proficient in Math, and 14% in English. These statistics are unacceptable. Taxpayers told legislators that they know East Ramapo already receives more state and federal aid than any other school district in Rockland County, while delivering the lowest graduation rate. They know the district has been cited by the education department multiple times for illegally diverting funds to private religious schools, and is even being investigated by the Attorney General for selling district property below market value. They agree with Hank Greenberg: “Not one more cent without oversight”. After the visit several legislators joined on as cosponsors, and Sen. Carlucci got the Senate Education Committee to agree to place it on their agenda. Stay tuned for the next steps to support this innovative and fair solution for the crisis in East Ramapo. Cablevision News 12 will air a special report “A Tale of Two Districts”, featuring Emmy Award winning journalist Tara Rosenblum, on Wednesday, May 6 at 5:00 PM. The New York Civil Liberties Union Lower Hudson Valley Chapter will present the Myron Isaacs Community Service Award to Arlene Popkin, Longtime NYCLU Board Member and Legal Aid Attorney, and Oscar Cohen, Willie Trotman and Steven White, Advocates for Educational Equality in East Ramapo. The Keynote Speaker will be Norman Siegel, Civil Rights Attorney and Former NYCLU Executive Director.